The daily apparent movement of declination of the sun near the solstice is very small. On the third day from the solstice it is about 1ʹ of arc and within a day of the solstice only 0ʹ.17 of arc or 12ʺ of arc. Detection of this very small amount, while technically feasible would require ideal foresights and long alignments. A long alignment, e.g. 30km. or more, inevitably mean low altitude of about 0⁰.5 when refraction effects may prevent the required precision. Thom believed that he had identified four such sites in SW Scotland; one each for the rising/setting, summer/winter solstices. (MLO Chap. 4). One of the possible foresights, about 30 km. NE of Peninver (NR 7614 2541)which is about 10 km. NNE of Campbeltown in southern Kintyre, Thom admitted was not indicated by the backsight. As such no reliance can be placed on the declination found. 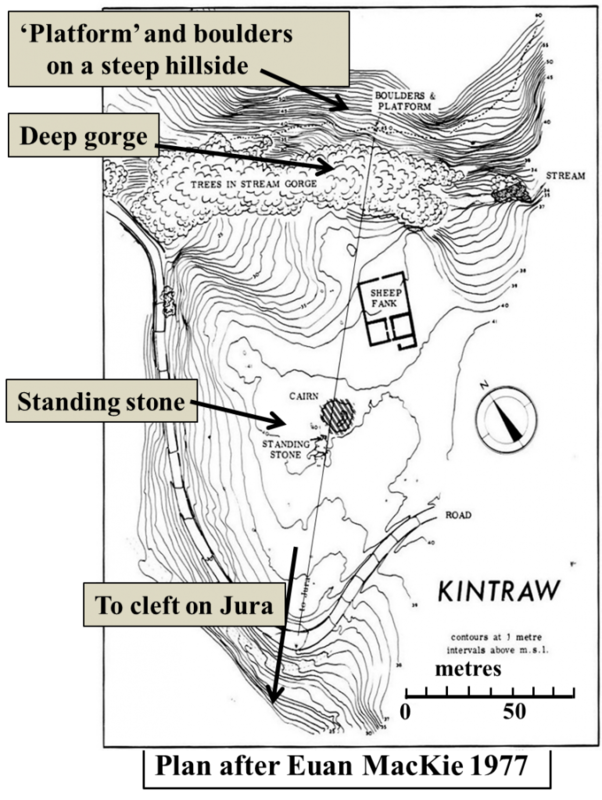 The site at East Loch Tarbet on Jura (NR 6089 8221) has not been visited. The supposed foresight about 50km. to the SE is not well indicated. There are two stones about 550m. apart only one of which even approximately indicates the required direction. A possible but uncertain alignment. A row of three large slabs set across the line. The central slab gives a clear indicated direction towards the NW, to Jura. Along the line of the stones to the SW is a cist 35m. away The same line appears to indicate the western end of Cara Island 11km. distant. Thom had alignments in both directions, but that to Cara Island is doubtful. A drawing by the antiquarian Edward Lhuyd in 1699 clearly shows three cairns in line with the three stones, the largest of them built over the cist, and would have blocked the view to Cara Island. 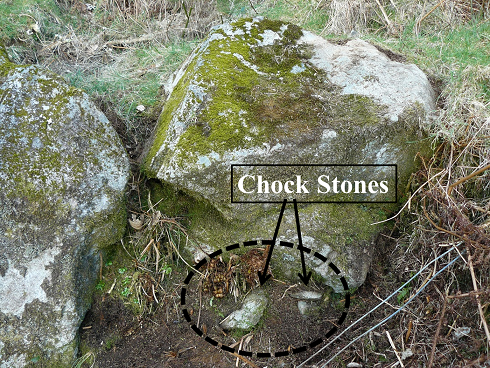 The drawing shows a fourth stone beyond the three cairns. The burial cist (a box-shaped tomb with four side slabs) is still visible at the site, although the mound and the other features sketched by Lhuyd have been destroyed. The remains of this cairn were excavated in the 1960s, and the archaeological evidence indicates that it is very unlikely to have been constructed as late as the mid-second millennium B.C. Thus the large cairn which was over the cist almost certainly predates the stones and Cara Island would not have been visible from the stones. Additional points are that the alignment length of 12km. is short for an alignment intended for the day and the altitude would have been about -10ʹ of arc with resultant likely refraction problems. However an alignment for purely ceremonial purposes, perhaps with viewing from the SW side of the large cairn, is entirely possible. The slope for Corra Bheinn (pron. ‘vane’) is closely parallel to the path of the setting sun, and so is suitable as a foresight. Four separate sets of measurements were made on different visits. The results were in close agreement, and showed the path of the upper limb of the sun at the solstice (using the value for ε: 23⁰ 54ʹ.2 ± 0ʹ.7 as derived by Thom) was about 2ʹ of arc clear of the upper part of the slope. Thom used various refinements for such long alignments which I have not done. E.g. adjustments for graze effects and for temperature effects on refraction. 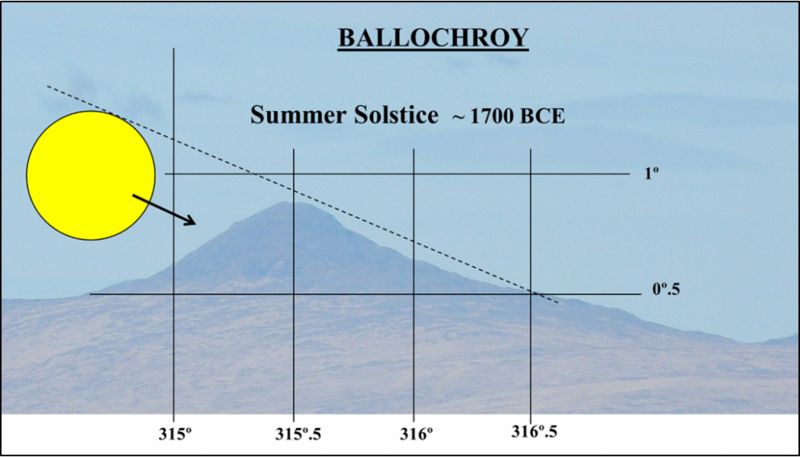 Note: Ballochroy is discussed in Astronomy in Prehistoric Britain and Ireland by Clive Ruggles, 1999, pp21-25. The site was assessed by a group of which Ruggles was a member. 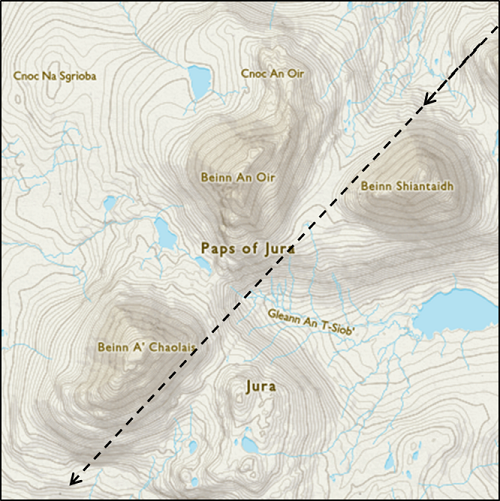 The survey results agreed closely with Thoms’ conclusions regarding the alignment to Corra Bheinn. The paper is referenced in Ruggles 1999 book (note 35, p25) and given in the bibliography.. However Ruggles discounts the significance of the results and of the site. (Bailey et al. 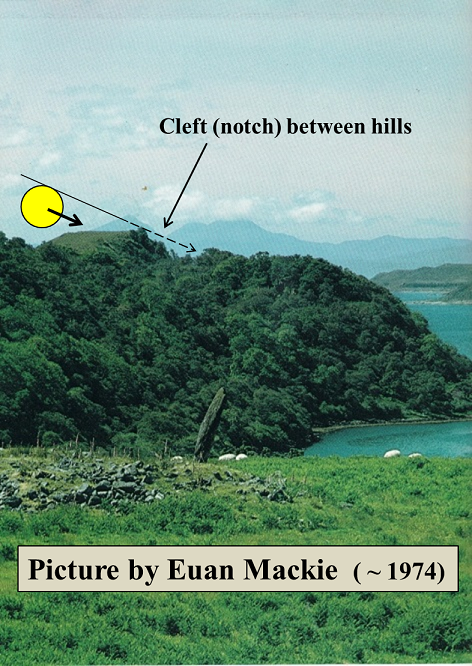 ‘Survey of three megalithic sites in Argyllshire’, 1975, Nature 253, 431-3). 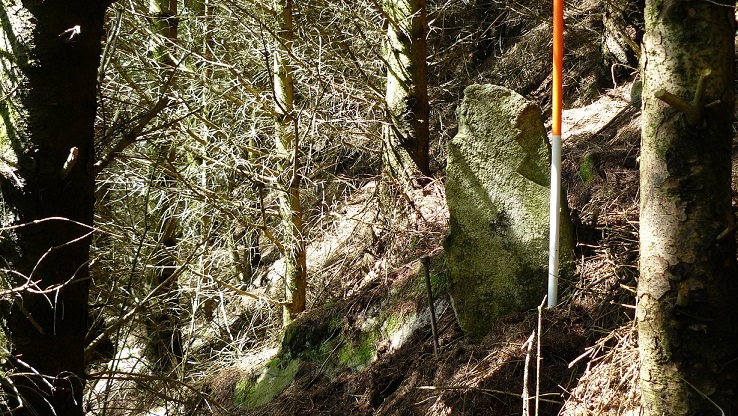 Thom found the ‘platform’ as a step on the steep hillside to the NE of a deep gorge and at a slightly higher level than the nearly level area where there is a standing stone and cairn. On the ‘platform’ are two large boulders almost on the edge of the gorge and firmly chocked. The line from the boulders over the standing stone and cairn leads to the distant cleft on Jura. It has been claimed that the boulders may have rolled down the hill and stopped where they are found. This is so improbable as to be discounted. It is a steep hill. The boulders would never have stopped where they are. There are no other boulders in the vicinity. They are on the line to the cleft. The blunt points on each are closely aligned and about 10cm apart. Euan Mackie excavated here in 1974 finding that the platform appeared to have been paved, but found no material which would have enabled dating. The stone on the right was excavated and as shown there is a bulbous end deep in the ground. Conclusion? They were placed here. On the now heavily wooded steep hillside, about 30m. up the slope is the ‘watch stone’. This is a small (o.8m. high) standing stone which Thom considered marked a warning position for the observer(s) on the platform. A gentle, then stronger, tug revealed not the slightest movement implying that it is very firmly secured. 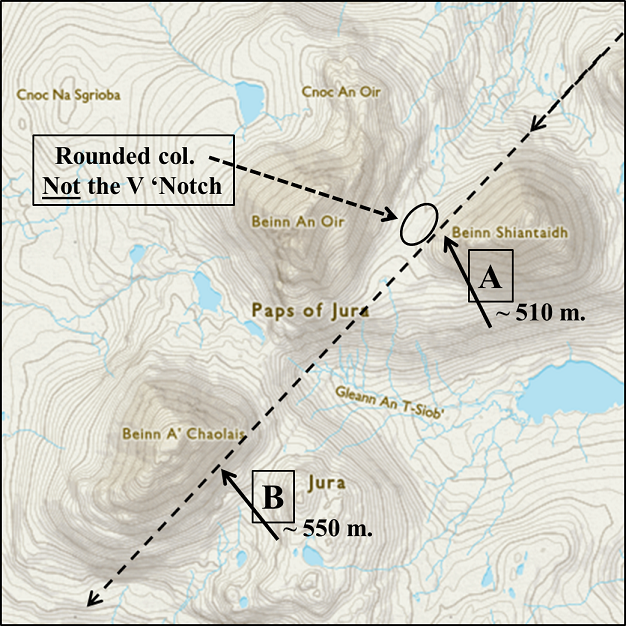 In view of the present impossibility of making observations, an attempt was made to reconstruct the azimuth and altitude of the cleft on Jura in the hope that the results might help to determine the genuine or otherwise nature of the alignment. This follows. 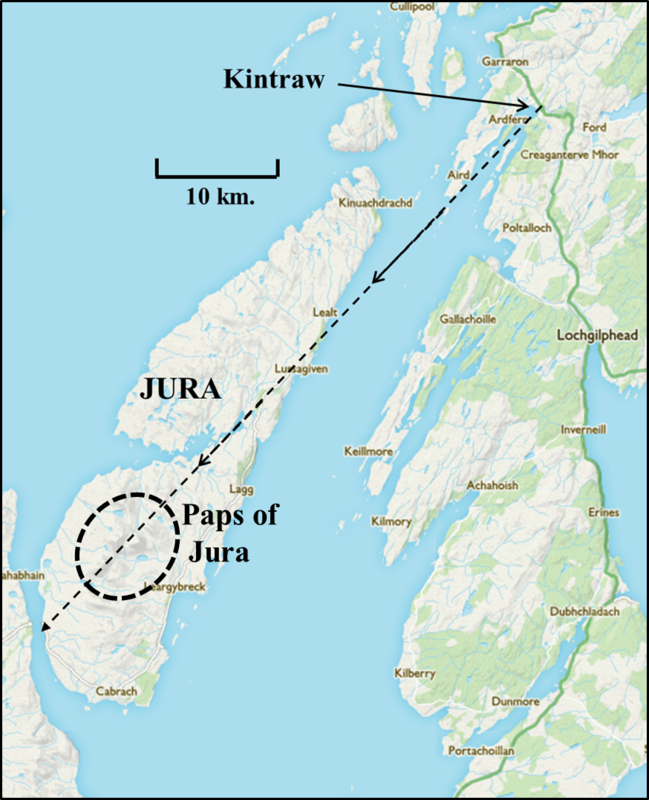 Since observation of the distant ‘cleft’ on Jura is at present prevented both by nearby trees and trees on the ridge about 1 km. to the south east, a calculation was carried out. It was hoped that this might indicate whether or not the alignment was 'real'. The Paps are steep sided mountains with mostly scree slopes. It will be seen that the ‘cleft’ is not the col, which is rounded and at a lower elevation, but formed be the intersection of two steep slopes at different distances. the best fit. i.e. such that the altitudes of the hill slopes at ‘A’ and ‘B’ as viewed from the 'platform' are the same. 3) The curvature of the Earth . The Angle of Dip can be found from:- d = 3.57√h where d is the distance to the horizon in km. and h is the height from which the observation is made in m. (from ‘Wikipedia horizon’ ). The calculations using the above can give an altitude for each of A and B. Thus the effective height difference between the platform and A is 510-(45+153) = 312m. These tell us that the positions found (and hence the heights) for A and B are close to the ideal. However the above is somewhat simplistic, particularly with regard the determination of what is termed the ‘effective height’ of A and B. The previous calculation showed that the heights of A and B are likely to be close to correct. These are used in the programme together with 6 figure grid references. Conclusion:- These results, where the calculated values are close to those found by measurement, effectively confirm that the alignment is probably correct. It is often claimed that variable refraction would prevent reliable measurements at low altitude. However the close agreement between the observed and calculated values imply that there is no significant problem. Thom determined that the very small change in declination of 12ʺ of arc a day before /after the day of the solstice could, given ideal conditions, be observed by moving 19 ft. (about 6m.) to the left from the solstitial observing position at the boulders. However there is a problem here. It was pointed out by McCreery et al. ( in Archaeostronomy in the Old World , Heggie, ed. 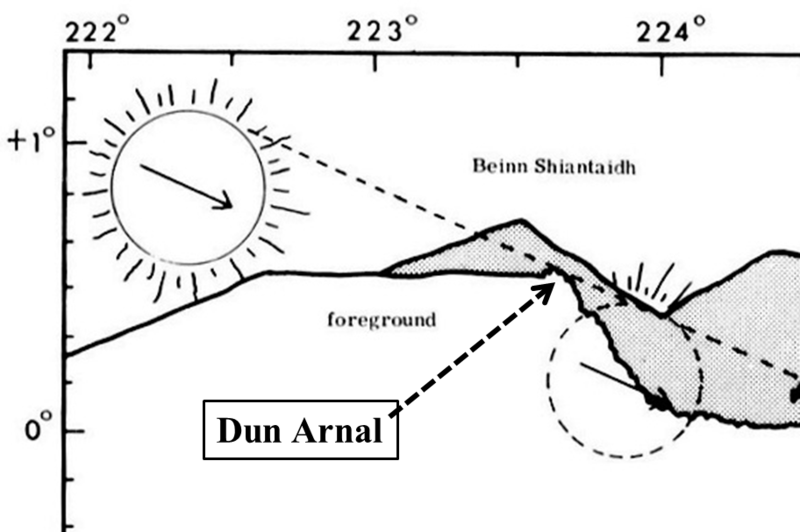 1982, pp183-190) that doing so would result in the view of the notch being obscured by Dun Arnal. Perhaps there is an alternative. The view looking back towards the ‘platform’ from beyond the stone and cairn. Note that the field is only about 4m. 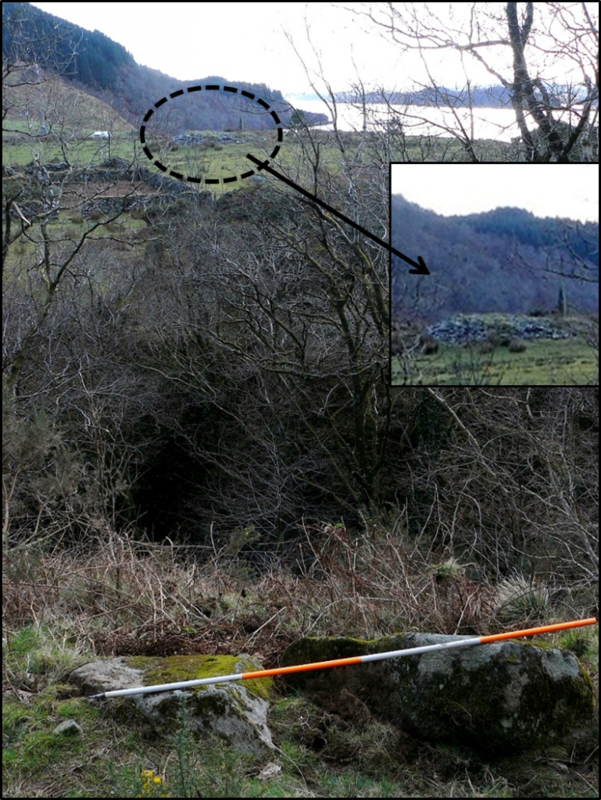 below the platform and the present height of the cairn. 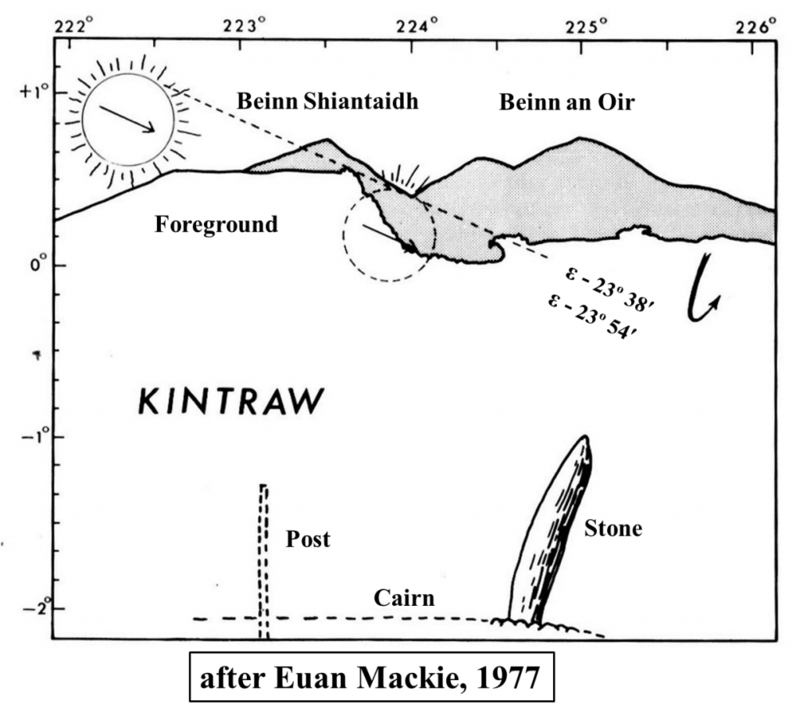 ‘A date somewhere in the first half of the second millenium BC is suggested for the cairn, which is thought to have been originally covered in white quartz.’ It was also noted that the cairn was of an unusual structure. 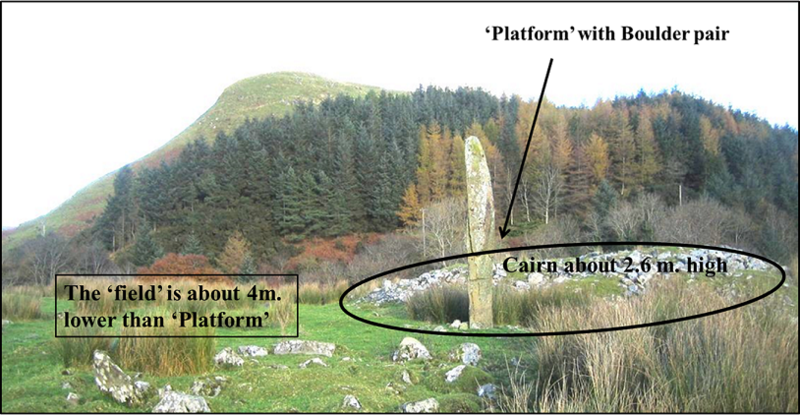 The suggestion, therefore, is that the alignment, having been determined from the ‘platform’, was thereafter viewed from the cairn. The viewing height would need to be about 1.5 m. higher than the 2.6m. height of the cairn today. There is evidence that some of the cairn was used for building the nearby sheep fanks and so in might originally been higher. Alternatively, or in addition, there could have been a wooden platform/ ‘walkway’ built on top of the cairn.